This is a small demo for 2 new features in TAdvStringGrid 2.0 First, it is now possible to define the fixed row from where column sorting is controlled. 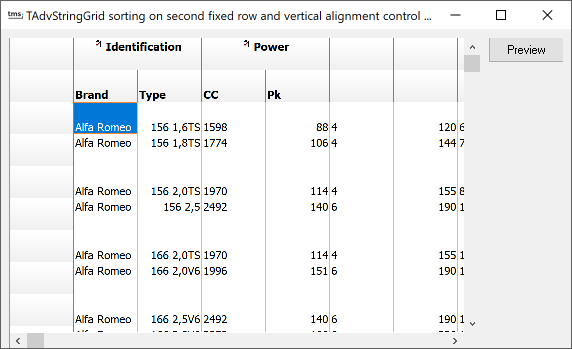 Secondly, vertical cell alignment can now be controlled per cell through the OnGetAlignment event hander. To allow another row to trigger and show sorts of columns, set the new grid.SortSettings.Row property to the row of choice. Note that this must be a fixed row.